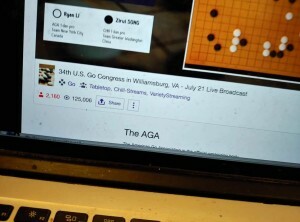 Coverage of this year’s US Go Congress took a giant leap forward with two innovations. 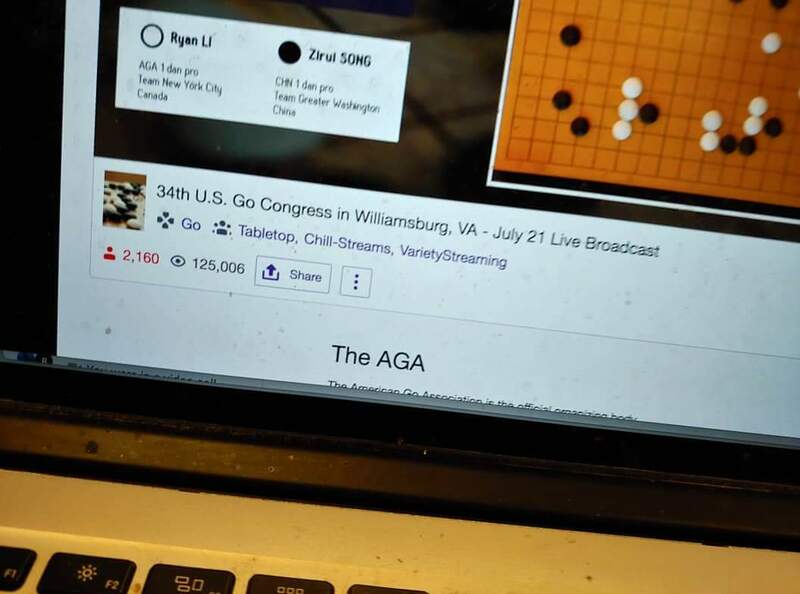 One was the social feed in the new Go Congress app, which enabled both Congress attendees and go fans worldwide to follow the action in Williamsburg; big thanks to Gurujeet Khalsa for making this happen and to everyone who posted, especially our two intrepid reporters, Julie and Matt Burrall, who seemed to be everywhere all the time with their updates on all things Congress. The other was our Twitch broadcasts, which attracted audiences unthinkable just a few years ago, hitting over 12,000 at one point. Stephen Hu, Nathan Epstein, Joel Cahalan and Eli Ferster did amazing work, whether behind or in front of the cameras, supported by Andrew Jackson and Michael Wanek offsite. 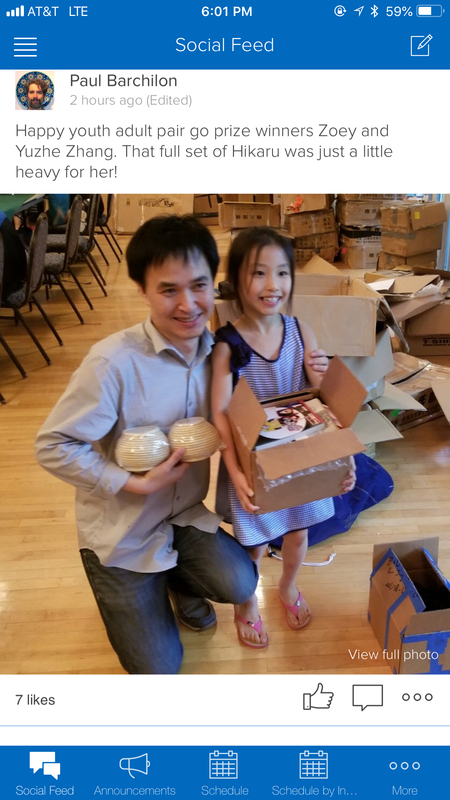 Big thanks to all of the c asters who participated this year — Ding Wei 9p, Yilun Yang 7p, Mingjiu Jiang 7p, Ryo Maeda 6p, Yoonyoung Kim 4p, Eodeokdung Lee 2p, Stephanie Yin 1p, Ryan Li 1p, Eric Lui 1p, Andy Liu 1p, Qucheng Gong, Zhaonian Chen, Albert Yen, Stephen Hu, Justin Teng, Edward Zhang, James Pinkerton, Jonathan Hop, Keith Arnold, Chris Garlock, Julie Burrall, Samantha Fede, and Samantha Soo — sometimes recruited at the last moment but all enthusiastic in their support for this tremendous new way to bring go events to a worldwide gaming audience. Special thanks as always to I-han Lui for all his help coordinating the professionals, and to Daniel Chou for translation. A very special shout-out to our game recorders, without whom these broadcasts couldn’t happen: Dennis Wheeler and Richard Dolen brought us the morning games, while Bart Jacob, David Weimer, Anthony Long, Russell Herman and Dale Blann provided evening coverage. Thanks too to our friends at KGS, led by Akane Negishi and her band of merry admins. This year’s tournament directors not only did their pairing jobs admirably, but got results to the EJ team promptly so that we could keep the crosstabs — US Open Masters and US Open — updated: Joshua Lee, Justin Teng, Todd Heidenreich, Steve Colburn, Qucheng Gong and James Pinkerton. Joining the Burralls on our crack EJ reporting team were Samantha Fede, Paul Barchilon, Justin Teng and photographer Phil Straus; check out their reporting here. Last but never least, this year’s Congress Directors, Nate Eagle and Diego Pierrottet, not only put on a great Congress — with the help of a lot of friends — but they went out of their way to support the EJ team to ensure that both attendees and those who could not be there were able to follow all the action at this major annual American go event. We owe them both official EJ team caps! 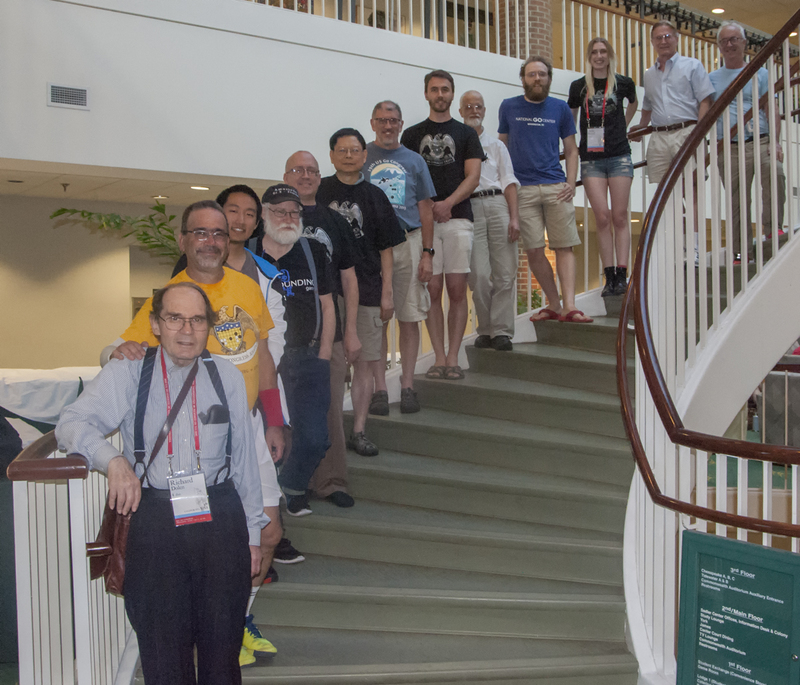 Go is a great game, but it’s the amazing people who play it that bring us together year after year. For me, that’s especially true of this phenomenal group of people who assemble each year, taking precious time from family and work obligations — and sacrificing time on the board we all love — to bring go to our community and to the world. For that I thank you all from the bottom of my heart. See you next year in Madison!